Game of Silence is playing the long game. At the winter TCA press tour this month, the series’ executive producer David Hudgins said there is a second season planned for the upcoming NBC drama. NBC has yet to announced a premiere date for the first season of Game of Silence. 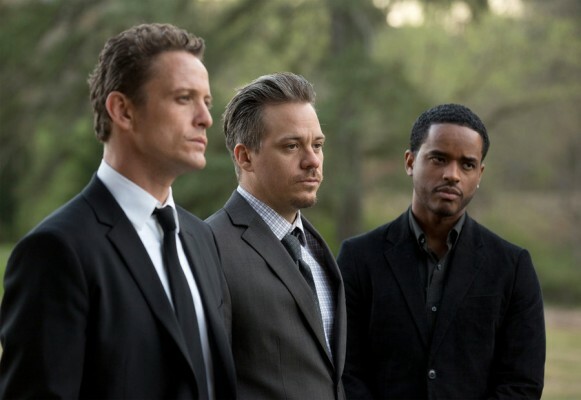 Based off a Turkish series, Game of Silence stars David Lyons as successful lawyer Jackson Brooks, whose livelihood is threatened when two friends (Michael Raymond-James and Larenz Tate) from his childhood come back to haunt him with a past tragedy. At the press tour, Hudgins said at the end of season one, “You get a result and you get a payoff.” He elaborated, saying that the finale will not only be satisfying for the story of season one, but it will also “open[ing] up the world to a whole other level” for a second season. What do you think? Are you interested in watching Game of Silence? More about: Game of Silence, Game of Silence: canceled or renewed?, NBC TV shows: canceled or renewed? My daughter & I loved the show. Why do they always cancel the good shows? Please bring it back. It always left us on the edge of our seats. My wife and I really loved this show and it sucked that they cancelled it to replace with a dumb show called the good place. Please bring it back u left us wanting more. Love the show!! I will be very disappointed if it is cancelled. Best show I have watched in a very long time. We are looking forward to season 2. Why would you cancel it. It is a really good show. Game of Silence left us wanting More!!! cmon NBC bring this one back. Best show nbc has had in a while. Game of Silence is one of the best shows we have seen in a very long time. We really hope they choose to continue the series. I hope they are able to release GOS air date soon. Is so odd being in limbo. Although I’m glad they are already talking second season; I will love just to see the first season soon! But hey all good things come to those who wait. Thank you for sharing!